What on Earth is Mölkky? And how exactly do you say it? Summer 2015 barely deserves that name, but as August starts and the school holidays draw to a close, of course, the weather takes a turn for the better! 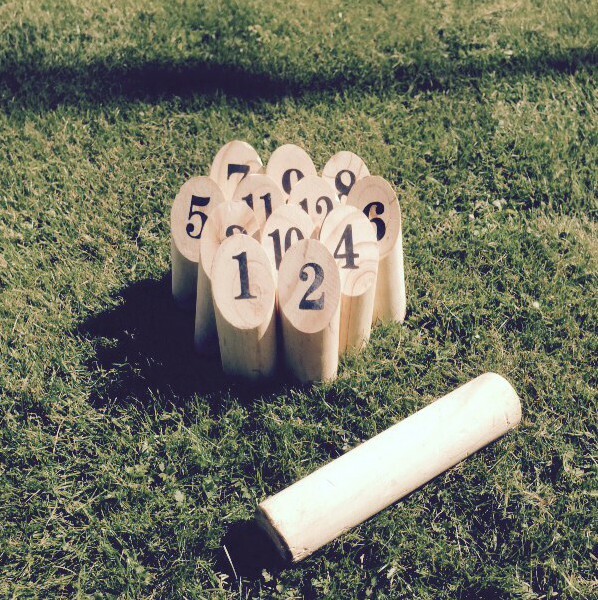 This is the perfect opportunity to try out our new garden game, Mölkky. To answer the 2nd question first, it is pronounced Meul-kuu. The first question needs only a little more explanation. Simply put, it is a bit like pub-skittles, where you use a wooden baton to knock over the skittles, numbered 1-12, scoring points as you go. Naturally, it’s the details that make it fun. At the start of the game the skittles are arranged on a group, close together. The players take it in turns to throw the baton to try to knock the skittles over. If you knock over a single skittle, you score the value on that skittle, if you knock over more than one, you score a single point for each. After the each turn the skittles are reset in the position they landed, so the game area soon starts to spread, isolating certain skittles, allowing them to be targeted more easily – but at the risk of missing all of them! The winner is the first player to reach the score of 50. Easy enough BUT if you go over, even by a single point, then your score is rest to 25 and you allow your opponents a chance to win. Simple, fun and addictive. The other great aspect is that almost any number can play. I’ve played one vs.one and in a group of 15+, so it’s ideal for summer parties, barbecues etc.